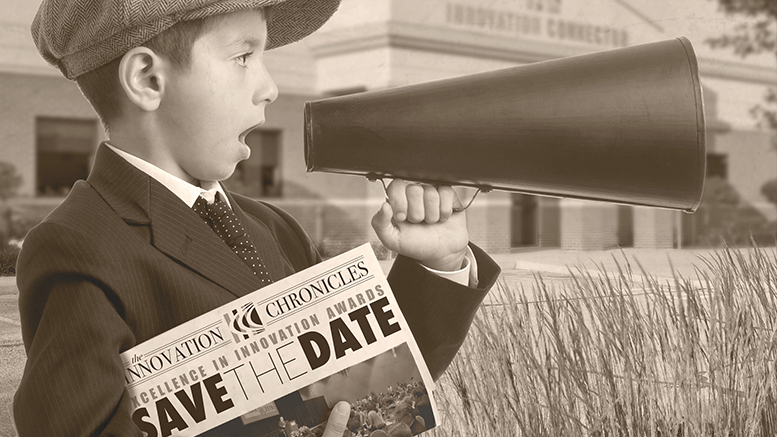 The Excellence in Innovation Awards will be presented on November 14th at the Horizon Convention Center. Muncie, IN—Last week I had the opportunity to sit down with Ted Baker, executive director of the Innovation Connector, to discuss the upcoming Excellence in Innovation Awards banquet to be held at the Horizon Convention Center on November 14th. My interview with Ted is below. Question: Ted, You seem very excited and animated about these awards. I see all sorts of printed materials about the event spread around your office. 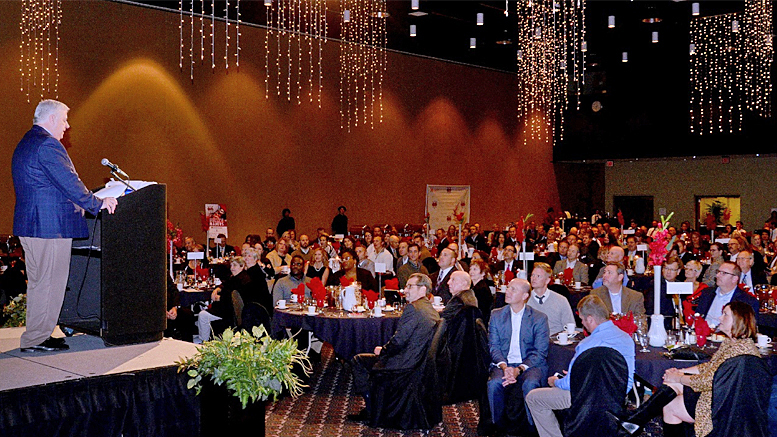 What is the Excellence in Innovation Awards banquet all about? Ted Baker, executive director of the Innovation Connector presents to the audience attending the 2017 Excellence in Innovation Awards. Ted Baker: This year we are going to celebrate our 4th Annual Excellence in Innovation Awards. Years ago, we were looking for a way to celebrate innovation that we see taking place in our community. Innovation doesn’t just happen in business; innovation happens in all manner of our daily lives. The Excellence in Innovation Awards banquet is simply an evening that we set apart for our community, in order to honor people who have been excelling in the area of innovation in business—or their livelihoods in some way. Question: Can you tell us about some of the past winners of the awards? Ted Baker: Innovation happens everywhere. Some of our past winners have been from the education sector such as Muncie Community Schools and Ball State University. Some have come from various business sectors such as manufacturing, retail and service businesses. So, we are finding innovation really happens anywhere. Last year we even had a circuit court judge (Kimberly S. Dowling) who was honored for innovative programs that were started in Muncie and are now spreading throughout the state. Question: At last year’s banquet you had “Two Chicks and a Hammer” and stars of the HGTV hit series “Good Bones,” as keynote speakers for the evening. Will there be a keynote speaker this year? Ted Baker: This year we are going to have a “TED Talk” style presentation, given by Don Wettrick, an innovation specialist at Noblesville High School. He is also the author of Pure Genius: Building a Culture of Innovation and Taking 20% Time to the Next Level. Wettrick has worked as a teacher, educational and innovation consultant, CEO, and podcast host. His podcast, StartEdUp, has featured some of the most successful entrepreneurs, authors and thought leaders in the world. He is also the founder of StartEdUp Foundation, a non-profit organization dedicated to help students harness innovation and pursue entrepreneurship. Question: I understand the finalists of the “Big Idea Pitch Competition” will be announced. Can you explain more about that? Ted Baker: That’s right. The evening’s events lead up to the introduction of the 5 finalists from the Innovation Connector’s Big Idea Pitch Competition. Each of the 5 finalists will pitch live, in front of the audience. These presentations are always a crowd favorite. Each finalist will have 3 minutes to pitch their idea, without the use of videos, Powerpoints™ or other aids. We will have judges on-hand who will judge each pitch presentation. The 5 finalists who will pitch will be selected on November 5, 2018 during the Big Idea Pitch Competition semi-finals. During the semi-finals on November 5th, around 50 people are expected to participate and pitch their ideas. The 5 finalists will be eligible for prize packages of nearly $30,000 in cash and services including options for accounting, legal, marketing, and video services. The 5 finalist pitches are always exciting and the audience is always amazed at the ideas and talent represented. Question: Last year a “Young Innovators” award was presented. Will one be presented again this year? Ted Baker: Yes, this will be our 4th year to present a Young Innovators award. Last year, freshman Robbie Sammelson from Burris won the award and we will be honoring another young innovator this year. We will also be presenting an Excellence in Mentorship award to honor an ultimate mentor from our community. We will also bring in Ball State Entrepreneurship students, who will have their senior projects on display throughout the banquet hall. Our Innovation Connector team, Lori Albert, Alexis Dishman and I strive to make the Excellence in Innovation Awards a classy event. We really go “all out” for this event and encourage members of the community to attend. The evening is primarily a way to bring people together to celebrate. Our community has a lot of good things happening. So, let’s celebrate!